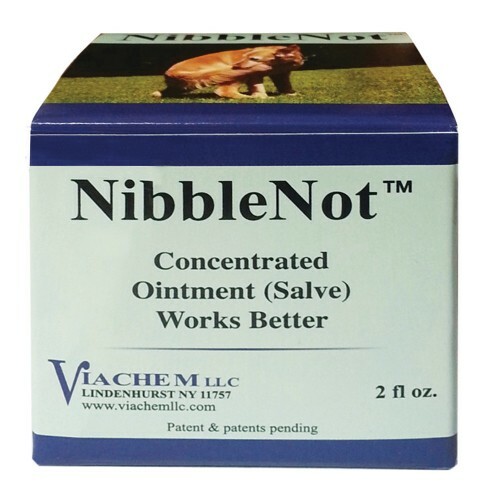 NibbleNot™ simultaneously deters animal chewing, licking, nibbling and/or biting, and promotes healing, when applied to cuts, bruises, rashes, abrasions, or medicated, sutured and/or bandaged areas. NibbleNot has also been found effective in curtailing tail chasing and biting behaviors. NibbleNot is effective for use with: dogs, cats, horses, rabbits, sheep, goats, cattle, and most other domestic animals and pets. 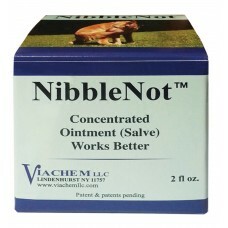 NibbleNot contains special vile, bitter, pungent tasting, and patented aversive agents which prevent animals from nibbling on or licking treated areas and destroying wound dressings or bandages, or from chewing on their coats. NibbleNot also contains special healing agents that can foster or accelerate healing of surface wounds. NibbleNot is for topical use only. Apply a thin coat of NibbleNot over the entire area to be treated, up to three times per day for no more than 10 days. (A thicker coat of NibbleNot should be applied when used for tail chasing behaviors and when applied to bandages.) Do not use on or near eyes, nose, mouth, teats, udders, genitalia or festering wounds. Discontinue use if area is infected or shows no sign of improvement, and consult a veterinarian. NibbleNot is an oil based emulsion, and is far more cost effective and longer-lasting than weaker, aqueous based products. NibbleNot should not be allowed to get on furniture, carpeting, drapes, textiles or anything else that is prone to staining. NibbleNot has an extremely awful taste, and steps should be taken to avoid getting it on hands and fingers. Apply it with an applicator, such as a cotton swab or cotton pad, and/or use rubber or plastic gloves. Wash hands with soap and water after use, especially before eating. No medical or veterinary claims are made for this product. Disclaimer: No actual claims are made for preventing, mitigating, treating or curing animal wounds. Any such claims are strictly anecdotal or based on ingredient manufacturers’ data or claims.